Please contact us to become a client so you can have Actionable Intelligence sent to you quarterly. As Eitel Insights forecasted the RBGV Condo market has indeed broken the first of its psychological support lines. As we continue to break the support lines we will see an ever increasing chaotic reaction to the condo market. The break below $675,000 has just occurred for the first time since September of 2017. Confirming what Eitel Insights has been predicting. The top in terms of pricing has occurred, we are now in the midst of a downtrend that will lead the Greater Vancouver Condo market continually lower until we break the downtrend, which we predict will occur between late 2021 and middle of 2022. The prevalent downtrend will take the Greater Vancouver average sales price from the peak of $751,000 in Jan 2018 to an expected base between $525,000 - $550,000 in late 2021 – mid 2022. March 2019 was the worst Condo sales numbers for the month of March since 2001. The total sales for the Greater Vancouver Condo market was 874. While inventory numbers are ever growing we are still not at peak levels that will come to into place over the next few years. 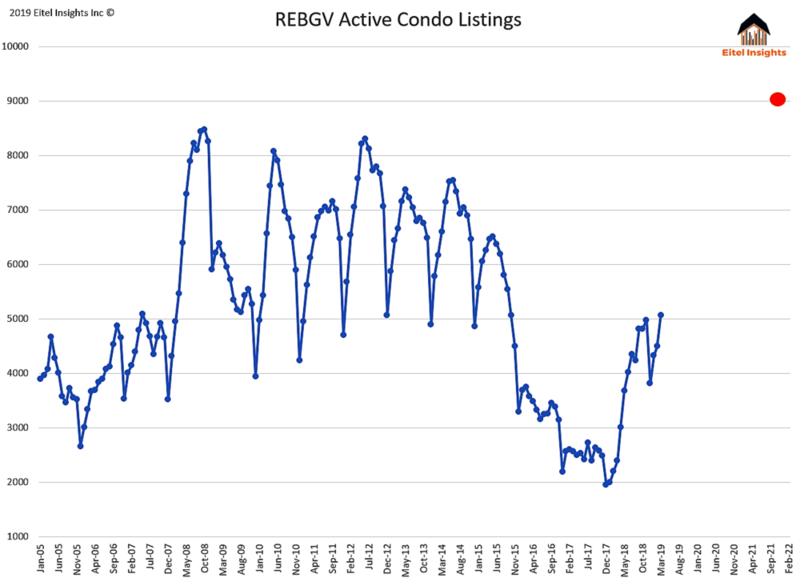 March had a count of 5072 total active Condo listings in Greater Vancouver we anticipate seeing the total active Greater Vancouver Condo listings to be at 9000+ levels in late 2021. Eitel Insights predictions continue to prove correct. Our prediction and market analysis has said for years the Vancouver Market had topped out and was going to begin receding into previously established prices while the market searches for the bottom. Over the past two years many analysts have been stumped and have kept changing their outlooks. Eitel Insights has held firm in our projections and continue to be proven correct with each passing month. Eitel Insights analytical interpretations allow us to tell a story behind each data point that is realized by the patterns of the overall market. We take out the emotions of gut feels and wishful thinking. Our non-biased information has helped our clients stay ahead of market changes and helped them keep calm and even optimistic about the forthcoming chaos to the Real Estate Market. Eitel Insights offers a diagnosis of any Real Estate Market. We study the data, discover trends, and identify market psychological behaviour, thus offering you our opinion on whether a market will experience a growth phase, stagnation, or pricing retrenchment. “corn will continue to grow in the fall because the summer had a great season”. We diagnose historic and current real estate activity through the pricing of active listings and sold properties. This approach allows us to see micro trends along with the larger more powerful trends, enabling us to offer our forecasts. Our unique analysis-based methodology of reading the tea leaves of Real Estate markets has proven to be correct across a multitude of regions. The initial break of the 10-year uptrend has transpired. The process of filling out the selling range is well underway as we predicted and published in October of 2017 (Western Investor). The February Average sales price for the detached home market for greater Vancouver has broken the ten year uptrend. The sales price of 1.47 million is the first time the sales price dipped below 1.625 since January 2017. This process of testing previously established prices will continue until late 2021. We still affirm our 2017 prediction that the prices will not fall far below this 1.4 million price point. However with new data comes new trends and thoughts. If the 1.4 is confirmed broken, the next established price point that will be tested will be 1.220 million, which will represent a total correction of 31%. The overall market will attempt to regain its position in the 10-year pricing uptrend over the next two quarters and once this attempt fails, the market will retract to the 1.4 million price point. The 1.6 million price point that was support has now become a ceiling that will be hard for the overall market to break. The number of available listings is continuing to grow as demand has dwindled. This is the key factor that will keep this market in a prolonged phase of no real price increases. In our opinion, the time to invest is not here yet. Yes, the price for the month of February did dip below 1.5 million as we predicted it would, however the inventory available during the next couple of years will continue to increase, applying additional pressure to the Vancouver Detached Market. Sales numbers for the detached market have hit ten-year lows. While we do expect sales to pick up from this point throughout 2019, we do anticipate these underwhelming sales numbers to continue until late in 2021. On average, over the past 13 years the Greater Vancouver Detached market had 5839 listed properties, in February 2019 there was 5632 listed properties. Eitel Insights believes in 2021, t we will see over 8500 listed properties. This will have be the main contributor to the 1.4 million pricing threshold or even 1.262 million as a worst case scenario. During 2021, foreclosures will be prevalent, and prices will bottom out. Consequently, investors will return to Greater Vancouver and the market will rise in value once again. Using Eitel Insights analytical interpretations are the only way to stay ahead of market changes. Our track record backs up our claims. Dane is the founder and lead analyst of Eitel Insights, a real estate analytics firm based in Vancouver. Eitel insights has recently been involved analyzing the detached housing and condo markets in the greater Vancouver area. Eitel Insights sits down with Tyler Orton on the BIV podcast (13:10) dives into potential real estate investment opportunities for British Columbians — if they’re willing to examine Canadian cities beyond the West Coast. We cover the Toronto Market along with Fort McMurray and Halifax. Looking at the Toronto aggregate average price points and constructing our technically analyzed chart, we see a current trend is known as a “flag” or “pennant”. This could indicate a continuation of an uptrend, and at first glance appears to be what is transpiring. However, because of the lack of any new highs being put in place above the $810,000 pricing threshold, we took a look at Eitel Insights’ proprietary supply/demand study and what becomes apparent shows a different side to the story; the Toronto aggregate market is in the midst of change, leading to a lower aggregate average sale price in the near future. In September of 2017 the lockstep movement between the supply and the demand dissipated. Since that point the sales numbers have dwindled without any of the high numbers that have been evident in past years. Not so coincidentally, the active listings are growing with each passing quarter once again in comparison to past years. The upcoming downward movement of the average price will inevitably come as a shock to much of the Real Estate market as most economists / analysts have seen this steady selling pattern as market stability. However Eitel Insights noticed the lack of momentum as a longer term reversal. The all-time highs in pricing occurred in April 2017 with an aggregate average price of $920,000. Since that time the prices have backtracked to the $810,000 becoming the more recent upper echelon in the aggregate average sales price. Eitel Insights predicts that the ceiling in prices will continue to go lower until the market ultimately breaks the uptrend instigated in March 20116. This will lead to lower average prices for the upcoming years. Additionally, by looking at the average sales price of Greater Toronto, there is a noticeable run up in pricing that occurred in the first quarter of 2016 seeing a price increase from $630,000 - $739,000. This price range will inevitably need to be more thoroughly filled out before the overall market can progress higher. An additional note on the Toronto Real Estate Market: Eitel Insights has performed the Exponential Moving Average study on the current aggregate prices. This study indicates that the death cross has been in place since April 2018. This is only the 4th time that Toronto has been in a death cross since 1982. Using our technically analyzed charts we notice divergent trends present in the aggregate average prices with higher lows and lower highs being put in month after month. These divergent trends will ultimately be resolved around the $300,000 price point. This number is a psychological level that will forever change Halifax, with no going back. Halifax is in the midst of welcoming a CFL team which marks its value across Canada as a growing city. That is the expectations of Eitel Insights as well. We believe that ultimately the $320,000 threshold will be broken and prices will experience another growth phase, with active listing levels lowering to numbers not seen since the 2004 market place. Over the next couple of years one could even anticipate those inventory levels decreasing further, possibly as far back as 2001 levels. Additionally we see all positive signs with regards to the sales numbers. Eitel Insights sees the demand peaking again over the next couple of years as prices soar past the $320,000 pricing threshold, making Halifax a great investment. When we look at Eitel Insights’ supply/demand study there is evidence of changing market behaviour. The active listing levels had been steadily at the highest end of the spectrum since 2013. However, over this past year the high level of active listings has been lowering, and not so coincidentally the demand has picked itself up off the floor. There had been a strong downtrend in the sales since 2008. The long-lasting downtrend has been broken in Jan 2018 and we are seeing an uptrend beginning to form with the sales signalling a recovery is on its way. All Real Estate Regions highlighted in our release are for sale for only $250. In each report you will get our full projections with forecasted dates and price points for optimal investing. Here, we present a cursory summary. Each report comes with a full list with all of the Analytic Studies we offer, and our analytical interpretation of each study. Real estate analyst Dane Eitel (1:00) of Eitel Insights explains how Metro Vancouver’s housing market is entering a “Death Cross” — an event that has occurred just seven times since before 1978. 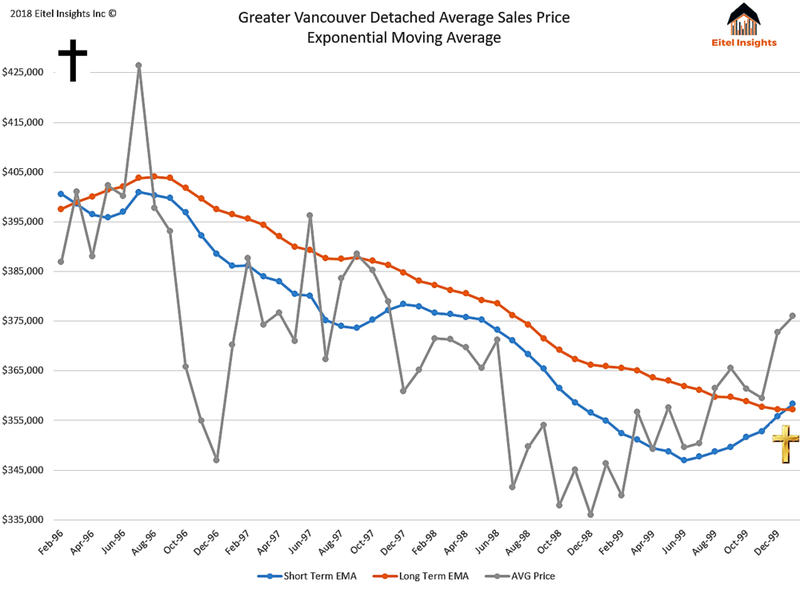 Dane Eitel, a Vancouver realtor and analyst, took Vancouver house price data going back decades and plotted “death crosses,” which are basically when the line representing short-term average price crosses below the line for long-term average price. It’s an indicator that immediate demand and price momentum are fizzling and there is the coming of longer-lasting decline. The method is used by some to gauge stock market trends, but it’s sometimes dismissed for putting aside all other factors except the relationship between short-term versus long-term average price. Eitel says there have only been eight “death crosses” in Vancouver housing since 1978, which is as far back as the Real Estate Board of Greater Vancouver keeps numbers for average pricing. The last one was in 2012, but it only lasted a year. Eitel thinks the current death cross, which he plotted in November, is more like the one seen in the 1990s due to a more similar run-up in pricing. Eitel predicts Vancouver detached homes that are currently averaging $1.7 million will bottom out at the $1.4 million mark in 2020-2021 before starting a new run-up in prices that ends with the average detached home price hitting $2.8 million in 2028. Meanwhile, number crunchers at the Eitel Insights group have been looking at the average house prices in the Greater Vancouver area, and they believe that some recent trends can tell us a lot about what to expect over the coming years. Greater Vancouver Detached Market signals dreaded Death Cross. This is only the 8th time since 1978 this long term exponential moving average indicator has crossed over the short term exponential moving average indicator forming what is known as a Death Cross, technically speaking. This last occurred in September 2012 lasting until June 2013. What Eitel Insights anticipates is a much longer occurrence of this cycle, we analyzed late 90’s market where the Death Cross lasted from April 1996 – December 99. This is more along the lines of what Eitel Insights expects for the Greater Vancouver Detached market. The Chart Demonstrates the Moving averages behavior since the last Golden Cross which occurred July 2013. At the peak point of separation in July 2016 the Short term EMA was priced at $1,683,000 and the Long term EMA was priced at $1,489,000, a difference of 11%. The Long term EMA has since eroded that differential and has subsequently made the jump over the short term EMA, where we believe it will remain until for a lengthy period of time. Link below to article written by Josh Sherman Featuring Eitel Insights EMA study. Eitel Insights featured on The Huffington Post. “Perhaps the most dramatic prediction comes by way of Eitel Insights, which used stock market-style analysis to forecast the future of detached home prices in Vancouver. While the benchmark price of a detached home was $1,524,000 last month, Eitel Insights anticipates that number will fall to $1.4 million between next year and 2021 at the latest. Link to Full article below: These Canadian Housing Markets Took A Beating In 2018. What Does 2019 Have In Store? We cover a wide variety of topics including the Vancouver condo market, stress test affect and touch on the Detached market as well. A big thank you to the Host Tyler Orton, it was a great conversation. Real estate analyst Dane Eitel: explains why the zenith of Vancouver’s condo market has come to an end and whether we can expect some sort of rebound anytime soon. Condo market will take three years to slump to average price of $550K, but will be back up to peak prices three years after that, predicts Eitel Insights. Eitel Insights Featured on The Lynda Steele Show. Eitel Insights can now alert the public to what we have shared with our clients over the past year. The condo market has officially broken the uptrends. The uptrends have been propelled the market over the past several years as you can see in the chart. The zenith in pricing has come and gone, when the average sales prices for the condo market in REBGV was $750,000. The Condo market will not experience a $750,000 pricing threshold for years to come. Eitel Insights offers you actionable intelligence that can still acted upon. However becoming a client has benefits that will open your eyes to opportunity where there is only perceived chaos. While the zenith in pricing is over, which is bad news for sellers the worst is yet to come. I know that doesn’t sound like particularly “Good News”, but imagine if you didn’t read this, or we didn’t offer our analysis to the public… the boards certainly would not alert you to such activities in all likelihood you wouldn’t even know that the uptrend existed, and has been subsequently broken…. Or even more incredulously, the worst is yet to come. Again our clients notice how easy the Real Estate Market is to participate in once we perform our analytics, and compile you a report. If you decide to list your condo now, you need to be realistic to the current market conditions and one can achieve a sale, and I would recommend the old adage of your first loss is your best loss will hold true over the upcoming years. Meaning, the process of selling will be a process again, many open houses, tough negotiations, and you will feel like you are settling for a price. However a year out you will be glad you took the offer you came to terms with. If you list your condo now and are not realistic, inevitably after one of your many empty open houses, your realtor might be honest enough to let you know they accidentally fell asleep for “just a moment or two”. Even if you have the “best unit” (which every seller believes the own) Buyers are not in a rush, the inventory is beginning to increase. Leading to the buyers having more choice, leading to waiting longer, thus perpetuating the cycle, the condo market is about to experience. Here is what the Detached Market of Greater Vancouver will experience in the upcoming years. In fact Eitel Insights predicts a drop of 26% based on from their zenith in pricing. Even with the stress test in place, there will be an opportunity to purchase detached homes, even if it be only temporarily. For the Eitel Insights clients during this time of perceived chaos is where we show opportunity. While the masses are running around like chickens with their heads cut off. We have prepared you for this exact place and time. This is when the bottom will take place and we can achieve our goals of buying in at the lows of the Vancouver Market. Once the lows have been put in for a year or so, the market will inevitably come back to the previous selling threshold and test that Resistance line. Resulting in the property we purchased at $1,075,000 regaining the value back to $1,400,000. Purchasing power has been slashed by 20% due to the stress test. Properties have not yet dropped to the point where the stress test affects have been nullified. Choices are either to change the asset class to be able to purchase, move out of the REBGV or simply wait it out until the affordability equals out. Due to the stress test instead of picking up the total 26% of buying power you are left with the 6% net gain. From the 100% purchasing price of 1,120,000, you receive a discount of $45,000 of the total $325,000 price drop. Once the reality set in of the new normal with extremely high levels of inventory compared to the past 5 years. The public and the media will report that the area of Greater Vancouver is in horrible circumstances with low average sales prices along with the relatively high numbers of foreclosure proceedings. Will the average home price in Greater Vancouver double over the next decade? Dane Eitel thinks so. And if it does, this will not be the first time Dane has successfully forecasted Vancouver’s real estate market. Dane joins Adam & Matt of Vancouver Real Estate Podcast to discuss his methodology and confidently charts not only his prediction of a short-term market collapse but also a market resurgence that will take Vancouver into the stratosphere with major urban centers like New York & Hong Kong. Eitel Insights Founder and Lead Analyst Dane Eitel, shared his analytical analyses with the listeners of News 1130 while touching on his previous predictions and how the stress test will effect those still trying to get into the market. Eitel says it’s difficult situation for first-time home buyers and those looking to move up in the market. For the rich, it’s not a big deal. It’s for the guys that are coming into the condo market trying to move up. They’re legitimately stress tests. To put a cap on this market and bring the prices down was for those people to be able to purchase. “If you’re qualified for $1.2 million pre stress test, that has knocked you down to $960,000 post stress test. Prices haven’t come down that far yet,” he said. “Once these prices come down, that’s still effectively 94 per cent of the buyer’s purchasing power,” he added. Eitel warns if first-time buyers don’t get in within a six to 12-month window in 2021, “they might miss this market forever." As published by Western Investor, Metro Vancouver's current housing slump will last until 2021, but will be followed by dramatic doubling in single-family prices. A real estate analyst, Dane Eitel, who accurately predicted Metro Vancouver’s housing crash a year ago says the current slump will stretch out for three more years. Thank you to the Lynda Steele Show of Global News for having Dane Eitel of Eitel Insights on their CKNW program. We discussed the Real Estate Market of Greater Vancouver and shared our detached analytical forecast. We believe the market has two divergent trends that will be resolved in Q1 of 2020. We anticipate a break of the 10 year uptrend, due to the powerful and extended nature of the current down trend. Resulting in a 26% correction by Q1 of 2021. Once again feel free to contact us for additional info. Our first published work. At the time of the article submission prices in the REBGV Detached market was 1,830,000 in May of 2017. As you can see we predicted that the market had topped out and would begin to fall. Most Real Estate market “experts” thought we were incorrect and the overall market was just in a pause and would continue to escalate for the foreseeable future. Our analytics said otherwise. From a narrowing in our proprietary Supply Demand Study and a triple top technically speaking we knew prices would begin to see a decline. Time since has proven that our analytics can predict momentum in any market and offers actionable intelligence.